President Donald Trump visited Elko on Saturday and painted the midterm elections as a crucial turning point in his first term that could mean the difference between staying the course to “make America great” or handing the nation’s future to a movement he described as resistance. The president said a blue wave could hijack his progress in office, hence his stop in rural Northern Nevada. He came to boost Republican candidates in two high-profile races — Adam Laxalt for governor and Dean Heller for U.S. Senate. Both are locked in tight contests. Trump spoke to supporters at the Elko Regional Airport on the first day of early voting, firing up the base to turn out and cast ballots for Republicans in the midterm elections. The Elko County sheriff estimated rally attendance at 8,600 people. “I have to thank Dean Heller for helping us with Justice Gorsuch and Justice Kavanaugh,” he said. When it was Heller’s turn to speak, he returned the praise while making a reference to Elko County’s mining industry, a key part of the region’s economy. The president’s remarks, which lasted a little less than an hour, included several hallmarks of a Trump rally, including derisive remarks about other politicians, referring again to Heller’s opponent Rep. Jacky Rosen as “Wacky Jacky,” Sen. Minority Leader Chuck Schumer as “Crying Chuck Schumer” and Rep. Maxine Waters as a “low IQ individual.” He dismissed the media as “Fake News,” calling them the single greatest ally the Democrats have. At one point, Trump asked the audience whether there were Hispanic voters in the crowd. The question elicited a tepid response, which the president acknowledged. Elko County has a Hispanic population of about 25 percent. The president’s question about Hispanic voters came during a portion of his speech in which he boasted about how low unemployment numbers and the Republicans’ commitment to preserve Medicare Advantage are helping them. It was before he repeated some of his most frequent talking points on illegal immigration. Trump said his campaign promise to build a wall along the U.S.-Mexico border is “moving along” and decried Democratic policies, such as sanctuary cities, that he alleged invite violent predators and drug dealers into the country. His rhetoric on immigration mirrored the hard-line views he has repeatedly used to rev up his conservative base. Earlier this week, Trump wrote a series of tweets threatening to stop all payments to Latin American countries that he said are doing little to stop the flow of illegal immigration into Mexico en route to the United States. He simultaneously demanded Mexico “stop this onslaught” or risk the United States closing its southern border. “A Republican victory will send the message that America will enforce our borders and defend our citizens,” Trump said Saturday. “The Democrat Party has become an angry, ruthless, unhinged mob determined to get power by any means necessary,” he said. Trump expressed confidence that the midterm elections would tilt in favor of Republicans, an outcome that could bode well for his re-election aspirations in 2020. Before the rally’s headliner arrived with Heller in Air Force One, Nevada Republicans running for top state offices took the stage and urged supporters to tell their friends and their neighbors to vote in the midterm elections — a nod to the many close races unfolding in the Silver State. Unlike Trump, they focused less on national politics and more on state issues. Attorney General nominee Wes Duncan spoke first and touted his commitment to keep Nevada safe. Duncan also took some shots at his opponent, Democrat Aaron Ford, by referencing his prior arrests as a college student in the early 1990s. Then Duncan highlighted the support he has received from Nevada sheriffs, indicating their mutual desire to ensure the state has enough resources to remain safe. Laxalt headed to the podium next and reiterated the same theme he has been using this entire campaign cycle — that the gubernatorial race boils down to preserving Nevada’s western character or letting it become a clone of California. Laxalt cast himself as the best candidate on rural issues, touting his lawsuits as attorney general that challenged an Obama-era Clean Water Act rule and a controversial conservation plan to protect sage grouse, an imperiled bird that roams much of rural Nevada. Laxalt went on to paint Sisolak as someone who would endanger Nevadans’ gun rights, raise taxes, add more business regulations and potentially divert water from the north down to Las Vegas. It was his build-up to telling rally attendees that the gubernatorial race was the “most important” for the future of Nevada. “So we need you all to be motivated,” Laxalt continued, pivoting to the importance of voting. 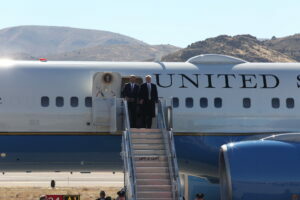 The last sitting president to visit Elko was President George W. Bush, who also spoke at the small airport. On Saturday, Air Force One landed on a tarmac adjacent to the stage. The rally followed similar stops in Missoula, Montana on Thursday and Mesa, Arizona on Friday. 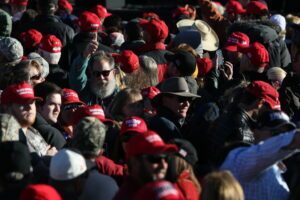 Supporters of the president came to Elko from across the Mountain West, traveling from Salt Lake City, Boise and smaller towns such as Twin Falls, Idaho. Darleene Speranza, who owns a pest control business north of Salt Lake City, drove about three hours to Elko Saturday morning. “It’s amazing what he has done to this country and how quickly he has done it,” she said..
She added that he has done that despite what she called the “ridiculous Mueller” probe and biased media coverage. Speranza said she has seen an uptick in business since Trump took office. Elko County is Trump Country. In 2016, the president lost Nevada but posted high turnout in rural counties. Trump beat former Secretary of State Hillary Clinton in Elko County with about 73 percent of the vote. High turnout in the rural counties is seen as key to a victory for Laxalt and Heller. 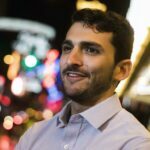 The rally, which comes on the first day of early voting, could boost turnout for those races and other Republicans in down-ballot races. But not all residents in Elko County turned out on Saturday. Elko County Democrats held a protest in downtown Elko about two miles from the airport. City Councilman John Patrick Rice, a Democrat and Elko’s mayor pro tem, said that he would not be attending the Trump rally. He said it’s important to him — to represent the small minority of Democrats in Elko — that he speak out when the president comes to town. Before the rally, four Elko voters waited for the president near where Air Force One had been cleared to park. They said they liked Trump because of his trade policy, tough talk on immigration and for trying to negotiate a nuclear agreement with North Korea. “You have to be an idiot if you don’t believe Trump is doing something,” said Daniel Fermoyle. They also said they were here to support the Trump because of his anti-establishment style. “The nice thing about it is Trump is not a politician,” said Sheldon Forbes.